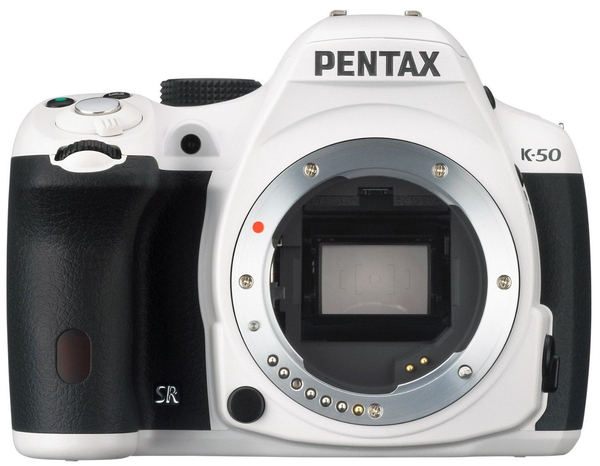 The PENTAX K-50 boasts outstanding basic specifications that rival many upper-class models, including high-speed continuous shooting at approximately six images per second, super-high-sensitivity shooting at ISO 51200, and high-precision AF with accurate tracking of moving subjects. This means that beginning digital SLR users and casual family photographers can enjoy high-quality digital photography with very little effort. The K-50 also features a weather-resistant, dustproof construction to assure solid performance under demanding outdoor conditions, and also to reduce the need for maintenance. It even provides a wide range of advanced shooting features, such as full HD movie recording and a selection of creative tools such as digital filters, to accommodate various shooting requirements. It can be powered by easy-to-obtain AA-size batteries,** in addition to the standard lithium-ion battery. Launched simultaneously with the K-50 camera body, two lens kits feature simplified weather-resistant lenses — the smc PENTAX-DA L 18-55mm F3.5-5.6AL WR, and the smc PENTAX-DA L 50-200 F4-5.6ED WR — to enhance the reliability and dependability of the K-50 imaging system. The K-50 is offered in 120 different color variations. 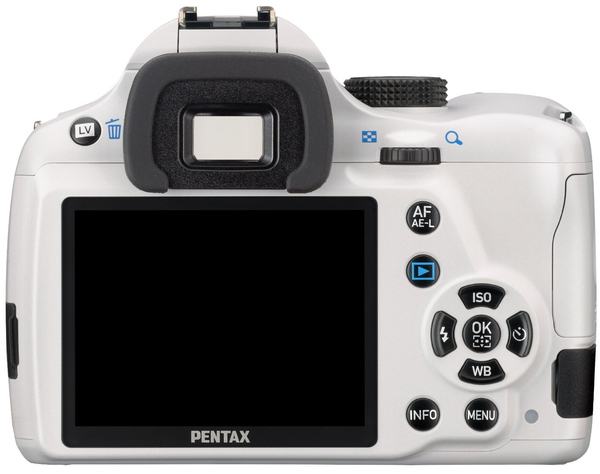 The color-to-order service has been extremely popular as a unique, stylish way for PENTAX camera users to express their own style in the choice of their camera system. * Based on PENTAX research, as of June 1, 2013. ** The optional D-BH109 AA Battery Holder is required for AA-battery operation. 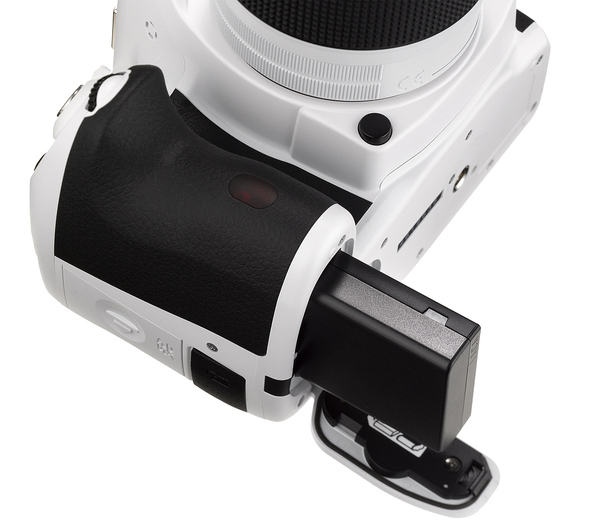 The K-50 features the state-of-the-art CMOS image sensor with a large image-capturing area measuring 23.7mm by 15.7mm, to assure high-speed image data readout. This image sensor is coupled with PRIME M — the same high-performance imaging engine incorporated in upper-class models — to deliver super-high-resolution, rich-gradation digital images with approximately 16.28 effective megapixels. The K-50 also offers super-high-sensitivity shooting at a top sensitivity of ISO 51200, allowing the photographer to handhold the camera for beautiful nighttime snapshots. Thanks to the 81 seals set in its compact, lightweight, portable body, the K-50 is built to be weather-resistant, dustproof and cold-resistant, even at temperatures as low as -10°C. This means that the K-50 can be taken along on outdoor activities such as camping, mountaineering and sports, for the joy of high-quality digital SLR photography without worrying about weather conditions. Its compact, functional body is carefully contoured with delicate curves, assuring that even a photographer with a small hand will have a firm grip of the camera. The PENTAX-developed SR (Shake Reduction) mechanism effectively compensates the adverse effect of camera shake to deliver sharp, blur-free images, even under shake-prone conditions such as when using a telephoto lens, shooting in the dark without flash illumination, or taking landscapes at twilight. This innovative mechanism works with almost all PENTAX interchangeable lenses — even those developed for film-format cameras. *** Thanks to the SR mechanism’s flexible design, which tilts the image sensor unit in all directions, the K-50 offers several useful features to assist the photographer during shooting, including an Automatic Horizon Correction function to assure high-precision image framing and effortless adjustment of horizontal alignment; a Composition Adjustment function to allow minute adjustment of image alignment both to horizontal and vertical directions, as well as slant-wise rotation; and an ASTRO TRACER mode to simplify astronomical photography in combination with the optional O-GPS1 GPS Unit. *** Lenses compatible with this mechanism: PENTAX K, KA, KAF, KAF2 and KAF3mount lenses; screw-mount lenses (with an adapter); and 645 and 67system lenses (with an adapter). Some functions may not be available with certain lenses. The K-50 features the state-of-the-art SAFOX IXi+ AF sensor module, which assures responsive, high-precision autofocus operation with 11 sensors (including nine cross-type sensors in the middle). It also features a spotbeam projector to assist AF operation at poorly lit locations. Its select-area expansion function keeps the sensor module tracking a moving subject, even when it moves out of a pre-assigned auto-tracking area, by assessing the distance data collected by neighboring focus sensors. This means not only greatly improved accuracy and speed of detecting moving subjects during autofocus operation, but also the enhanced auto-tracking performance of moving subjects when using a telephoto lens. When shooting sports, stage performances or wildlife, the K-50’s high-speed continuous shooting function comes in handy. It allows the photographer to record active, fast-moving subjects in a series of images, at a maximum speed of approximately six images per second (in the JPEG recording format). The K-50 captures high-resolution, full HD movie clips (1920 x 1080 pixels) in the H.264 recording format, with a choice of frame rate (30, 25 or 24 frames per second). It even comes with creative image-processing tools**** like Custom Images and useful movie-recording features like an interval movie recording function, for the production of more personalized movies. **** The frame rate may vary when nonstandard image processing is required. Despite a compact body common to all entry-class models, the K-50 features a glass prism finder with nearly 100% field of view and approximately 0.92-times magnification (with a 50mm F1.4 lens at infinity) to cover the entire field of view for easy focusing and framing. Since it delivers a clear view of the subject even in bright sunshine and eliminates parallax and time lag in the viewfinder image, the K-50 responds efficiently and reliably to demanding applications and subjects, such as landscapes requiring delicate, high-precision framing, and sports scenes where the timing of shutter release is critical. The infocus point is indicated as a red point in the viewfinder for at-a-glance confirmation. The PENTAX-original Auto Picture mode automatically selects the most appropriate shooting mode for a given subject or scene from Portrait, Landscape, Macro and other distinctive shooting modes. Since the K-50 sets all vital camera settings — including shutter speed, aperture, white balance, saturation, contrast and sharpness — the photographer can concentrate on image composition and shutter opportunity. 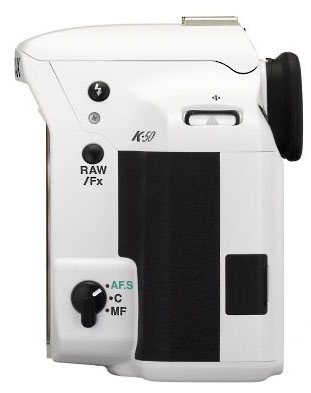 The K-50 also offers 19 Scene modes, including Night Scene Portrait, Pet and Backlight Silhouette, to simplify the photographing of subjects and scenes that could be too complicated or demanding for entry digital SLR photographers, by optimizing all camera settings with a simple choice of the corresponding icon on the camera’s LCD monitor. The K-50’s custom image function allows the user to easily and quickly select the desired finishing touch for a particular image, with a choice of 11 custom images. These include Bleach Bypass to create a dramatic visual effect used in motion pictures, and Cross Process to produce fanciful, eye-catching images with dramatic colors. The K-50 also provides 19 distinctive digital filters to add distinctive visual effects to captured images and produce creative, artistic images without the need for a computer. The user can even explore new creative possibilities by applying multiple filters to a single image. 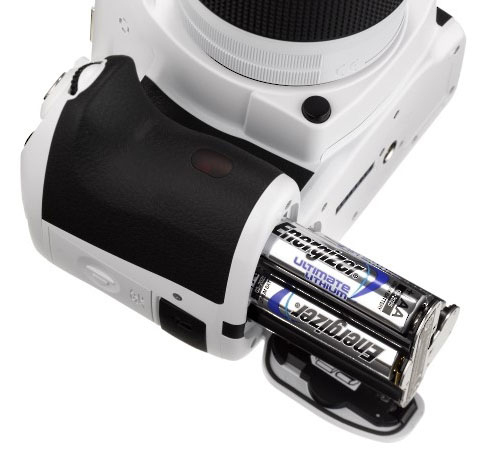 In addition to the standard rechargeable lithium-ion battery capable of capturing approximately 480 images with a single recharge,***** the K-50 can also be powered by four AA-size batteries using the optional D-BH109 AA Battery Holder. Since AA-size batteries can be easily obtained almost anywhere around the world, there’s no worry about battery shortages, even when on the road. ***** Under testing conditions prescribed by PENTAX, using the D-LI109 Rechargeable Lithium-ion Battery with no flash discharges. For the new PENTAX K-50, the color-to-order service allows for the selection from 120 camera color combinations (including three standard models). 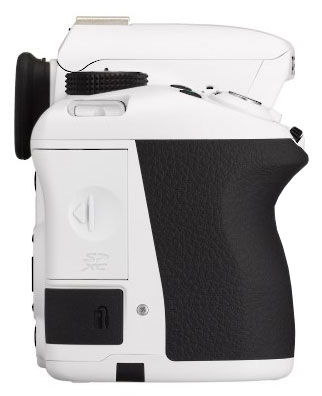 Each user can choose the desired color combination to more personalize their K-50 camera body. Color options : a choice of 20 body colors and six grip colors are available. For the Lens Kit with a black, white, red or pink camera body, with the black grip, the PENTAX-DAL 18-55mm F3.5-5.6AL WR lens will be of the identical color. The Lens Kit with any other body color comes with a black lens.